This post is Part 2 of a series to augment the Atlas of the Known World available for free download. Start with Part 1 here. A bleak, frigid land at the edge of the world. You voted Kholl winner of November 2014 by 94%. 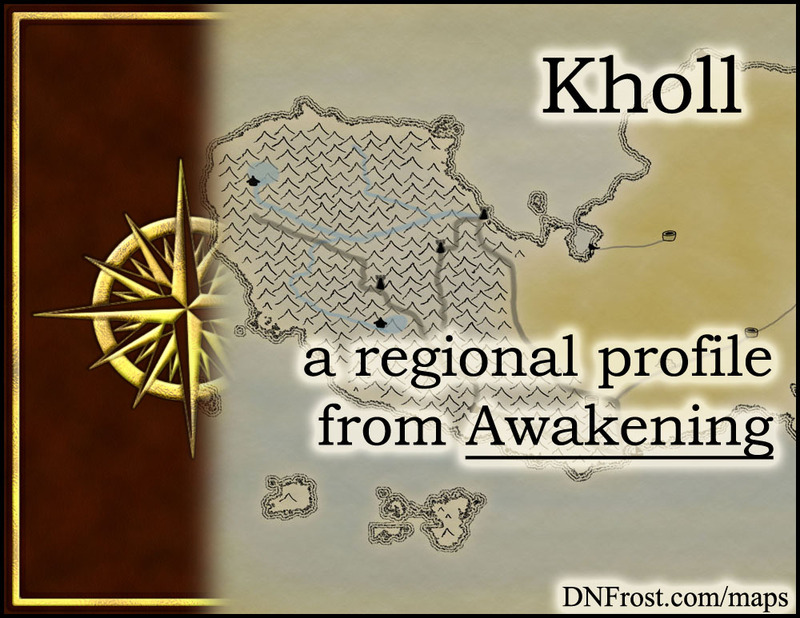 In Part 1 of Awakening, Kholl is a frigid land at the northeastern edge of the Known World. Each dark, brutal winter thaws into the gray drizzle of summer daylight, but little sunshine strikes the embittered land. The crags of the Khollek Mountains in the west crumble into the cold sand dunes of the Heleki Desert in the east, and the whole continent is windswept and barren. This region also borders the Katei Ocean, the Kondak Sea, and the Unknown East. The Khollic wasteland is inhospitable to most lifeforms. The cold shale mountains and crumbling sands prevent most plants from taking root, and Kholl supports little animal life. Though a few dragons dwell on the highest crags, they survive mostly on fish plucked from the sea, or on domesticated wyverns stolen from their pens. In the cold desert, the largest native animal is the arctic fox, which preys on mice, insects, and the occasional bony hare. The humans of this northern land are isolated from most of the Known World. Their dark hair, tanned skin, and narrow eyes protect them from biting winds and the blinding glare of reflections off the ice. Though both the mountain and desert men share ancestors, the arrival of Colkh'rak forces three centuries ago forever split them apart. Those who stayed in the mountains became slaves of their foreign invaders, and dissenters fled into the desert, forming a watchful rebel alliance. While the mountain men can access clothing and other goods imported from Kanata, the free men of the desert make do with the small animal hides available. In hard times, the desert peoples resort to wearing fish skins and weaving clothes from the fibrous kelp dredged from surrounding seas. Though all races of men access the same cocktail of magics, the men of Kholl manifest much weaker animal magic than the men of other regions. In exchange, they display exceptional sensory abilities, using flavor magics to enhance meager diets and their latent control of light to veil rebel encampments from their Colkh'rak overlords. Khollic men also enjoy greater access to elemental powers than the men of other lands, but their enhanced earth skills in turn augment their latent propensity for dark magic. The enslaved men of Kholl have mostly assimilated into the Colkh'rak culture, but Kholl's free men keep their ancient traditions alive. They place great emphasis on liberty and independence, virtues they find worth fighting and dying for. They live in large family clans, and each village self-governs with a council of the senior members of resident clans. While magic is part of everyday life, those born without strong magic skills are seen as destined for true greatness. Desert men push their non-magic clan members to excel at crucial tasks such as fishing, combat, and weapons-making. No matter their rank or ability, all men are considered equal, and it is a grave offense to issue orders to a fellow man. This impugns a man's liberty and demeans his independence before the clan, especially if the orders are given in public. The desert men measure their age in years, with the new year beginning on the summer solstice. Coming-of-age is celebrated within each clan, and though ceremonies differ, it always involves a demonstration of the youth's mastery of a vital skill or virtue, followed by a clan-wide feast. Some clans require youths to prove their bravery or cunning, while others expect the youth to venture into the wilderness and return with a trophy of sorts. Certain clans stage an indoor battle for the youth to engage in, and the subsequent celebration is delayed, often for weeks on end, until the youth emerges victorious. As adults, desert men and women must contribute to the survival of the clan, particularly by providing for and training the clan's children. The men and women of the desert all fight, though the residents of Olyagen are considered the most skillful in combat. This rebel encampment is closest to Kholl's western mountains, where the Colkh'rak overlords reign supreme. Since freedom is paramount to the desert clans, all adults are expected to prove worthwhile in battle, which is their first and often only line of defense against tyranny. Though skirmishes are commonplace, the free men of Kholl stand united under one banner, and there is no warring amongst clans or villages. Combat skills are imparted from a young age, and a man's prowess in combat is linked to his ability to retain freedom at all costs. The most sought-after women are highly-trained warriors, and a husband is considered greatly blessed if his wife can defeat him in combat. Kholl is a land of two languages. The free men of the desert speak their ancestral tongue, Heleki, a rather lyrical language descended from the ancient tongue of men. The enslaved denizens of the mountains speak Khollic, a harsh and sibilant language derived from the blending of their ancestral tongue, Trophek, into the language of their Colkh'rak overlords. Though neither Khollic nor Heleki is intelligible to the speakers of Allanic in the rest of the Known World, the Heleki tongue sounds somewhat related, and many Heleki words share similar roots. Khollic, however, sounds completely alien to both Allanic and Heleki speakers alike, and is often described as severely lacking in discernible vowels. In the book Awakening, Jorn is a stablehand enslaved in the Khollek Mountains by dark masters. Though he cannot remember his family, Jorn made a home for himself amongst the racing dragons he attends. But his world turns upside-down one night when a new slave named Larin escapes the master's keep and hides in Jorn's stable. When he finds her beneath the straw in a dragon's stall, Jorn decides to help her and unwittingly launches them on a journey that changes the course of history.